The caption on the lower right photo reads, "A Pacific-Theatre GI inspects a thatched shelter, 1911A1 in hand. Note that the safety is off, and his finger is on the trigger." Wearing the hats of musician, radio engineer and pilot afforded my dad many adventures throughout the South Pacific of WWII. These inspired memorable stories he brought back home — stories I wouldn’t come to appreciate until many years later. He was a good representative of The Greatest Generation — a gentleman and a tinkerer, someone who could string a wire across the basement ceiling and talk to other people who knew how to do the same thing half way around the world. This generation knew how things worked; they had real ingenuity. They built things to last. It was the generation that spawned the 1911. One time, I joked to a friend of mine, that if an alien race were to visit our planet after a nuclear holocaust, they’d conclude that life must have ended sometime around 1945. That’s because the only things left would be Royal typewriters and a few charred airframes from B-17s. They might find a 1911 frame, or an M1 Garand action. I was exaggerating to make a point of course, but like I said, they did know how to build things to last. Dad’s main job on Okinawa was flying transport from island to island under General MacArthur’s 5th Air Force. He later told me the C-47 was his favorite plane to fly, and that his cargo included everything from supply shipments to the one-and-only Bob Hope — a real highlight only to be topped later by an opportunity to fly MacArthur himself on his historic flight into post-surrender Japan. Actually, the twin-engine Dakota would later be credited as one of the top four essential developments that lead to the Allied victory; without it the troops simply would not have been supplied (or entertained!). There were three things that brought a measure of comfort to Flight Officer Graff: A parachute, a second engine, and a loaded 1911 on the hip. The second engine came in handy one time when carburetor icing cut the other engine out over open ocean. The 1911 was for the Japs if the second engine failed. 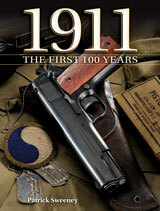 1911: The First 100 Years, can be ordered at GunDigestStore.com. The book, like the pistol itself, is solidly built with an attractive hard cover. The 1911A1 was issued to radio operators, machinegun teams, and officers. It was the obvious badge of office for those in charge, at least at the front. At the end of the war, my father’s commander, Lt. Campbell, had to go back to headquarters for a short while. He took off his holstered 1911, wrapped the web belt around it, and handed it to my Dad. That was the clear indicator, to anyone who had a doubt, that Sergeant Sweeney was in charge until the lieutenant got back. For some reason, Dad never brought his 1911 back from the war. Maybe that was because he wasn’t allowed to, or just wanted to bid everything about the military life a goodbye and good riddance. It was a good thing for me that he was a better pilot than a shot, because he admitted to having trouble “hitting the broad side of a barn” with the thing, especially during the one handed drills. Yet, “If you want a fine handgun you can’t beat a Colt 1911,” he’d say. And with that sentiment I say Amen, and pass the ammo, Dad. Click here to get your own copy of 1911: The First 100 Years. For me, the M1911A1, the slightly updated version that was made based on improvements suggested from use during World War One, is the best semi-auto handgun on the market today, 100 years after the M1911 was first made. I was told by some that I could not handle a .45 ACP, especially in the 1911. WRONG. It is the most comfortable handgun I have because of the ergonomics. I love the two I have, a GI and an officer’s model, and I have another one the way. I’m trying to get rid of a polymer 9 mm, which is a good gun but does not have the stopping ability of the .45 ACP. Also, Sweeney’s book is excellent as are his others on the 1911.